In the very first Live Sales Management Lab, we discussed how to go above and beyond quota, which means helping our salespeople to identify those personally meaningful goals that are going to stretch them outside of their comfort zone, so that they can accomplish things they've never accomplished before. And more importantly, why do we put it off? Why do we avoid these kinds of the conversations which are so crucial to change? The answer: It's work, and we know it's work. So we tend to put it off. Or we think, "You know what? They have a quota. That should be enough to motivate them." Meeting your quota for your salespeople is about as motivating as them getting up in the morning excited to pay their taxes and student loans. It's something we have to do to not end up in jail or to keep our jobs. It's not the thing that's going to compel us to make changes that we might be a little bit uncomfortable with. Your main job as a manager is as a coach. As a coach, you're trying to help your salespeople change behaviors. As cognitive behavioral therapy will tell us, change can't happen until a personally meaningful stretch goal has been identified. And a quota isn't it. One salesperson that I worked with wanted to be able to make an additional $50,000 in a year so that their wife could have some treatments done so that she could get pregnant, because they'd been trying to have a baby. Now that is a personally meaningful goal! Other salespeople that I've worked with were on-plan. They were about to get fired. So meeting quota for them was probably pretty important. Except what I saw happen is that the more they focused on meeting their quota, the more hung up they got and the more scared they became. And they weren't willing to take the risk or make the changes that would actually get them there. When they stop focusing on quota and instead on their personal goal, they didn't make quota. They blew past it. And not a little, we are talking a minimum of 50% past quota, upwards of 250%. So how do you help your salespeople get past what their quotas are? There's actually a five-step process that I'll share with you in just a few minutes. 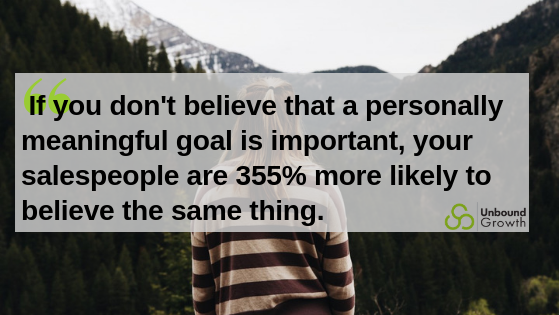 But before I do that, I need to say this to sales managers: If you don't believe that a personally meaningful goal is important to you, your salespeople are a 355% more likely to believe the same thing. I did some independent research and analysis on data of salespeople and found that this was true. Not only that, I also found that managers who held beliefs that supported personally meaningful goals, their salespeople were 355% more likely to hold those same beliefs. What you can take away from this is that if you don't have those, it's going to have a much bigger impact on your team. Additonal data analysis of salespeople found the managers who were able to create a environment and structure for personal goals had 17% stronger salespeople. Now, how do you get to those goals? How do you help your salespeople find the things that are going to make them do the things they normally wouldn't? There's a five-step process that was actually identified by the Dominican University. In it, they found that people who followed these five steps were significantly more likely to reach their highly outrageous goals than anyone else. The first step is actually relatively simple. This is a step that you can start in the interviewing process if you're getting ready to hire salespeople. And that is, have them think about it. Have them daydream about it. Have them talk with their spouses and family and close ones about what does it mean for them to achieve a certain thing. Now maybe it's that they want to have a certain lifestyle. Maybe it's that they want to be able to prove themselves. There is no good or bad goal, only what's personally meaningful to them. After having your salespeople think about and daydream about their goals, the very next step is to write them down. Not just write down what the goal is, but with description. I want them to visualize what it's going to feel like, what it's going to smell like, what it's going to look like when they get there, where ever "there" is. Whether it's buying a house, going on vacation, or proving that they can do it. That's another important point, because the very next step after thinking about it and writing it down, is creating action commitments to it. Any goal, whether it's intangible or tangible, can be quantified. In quantifying it, you're also identifying what actions you need to take. Ask yourself, what steps do I need to take? What disciplines do I need to develop in order to get there? It's not a question of "if," it's a question of "how." Together with those goals that you've written down and that you created action commitments with, your next step for your salespeople is to then share it with someone, someone who's supportive. Hopefully, that's you as their manager. But that can also be someone on their team. It can be their spouse. It can be a peer group of some type. As long as they have outwardly shared it and not kept it hidden in close to their chest. Because then again, there's that whole, "Well, what if I fail?" Then nobody will know, and I don't have to worry about it. Not only do they need to share it with them, but then they also need to make weekly reports to that person. Again, this is a great way that you can actually build relationship with your teammate and actually have your team build relationships with each other. I had one manager that not only shared their personal goals with their team as a way to show the example, but had them also share it with each other. Every week they had a small round table of, "Here's the progress that I've made toward my personal goal." It was never about the quota. The quota happened because their goal was bigger than their quota. Remember, you are the example. Start with yourself. If you can do this process with yourself, and even with your superiors, it's going to make it that much easier for your salespeople to do it. Then 2019 will be the year of the quota-busting team! So take those five steps. Have them think about it, write them down, create action commitments, share it with someone else, then make weekly reports to that person. Those five steps will make your salespeople significantly more likely to not only reach their personal goals, but to blow past their quotas. There's a simple worksheet that you can actually use to help walk you through this process. Click here to download your copy of the Goal Setting Worksheet.